Marllon Lucas 1 year, 11 months ago. Android Nougat 7.1 ROM, LineageOS 14.1 for Galaxy NOTE 10.1 WiFi (2014 model) has now arrived via an UNOFFICIAL build. If you want some more Lineage ROMs or wanna taste the OFFICIAL Lineage build then stay tuned to the Lineage OS 14.1 ROM collection page. This LineageOS for Galaxy NOTE 10.1 2014 WiFi variant is brought you by developer ZakooZ. If you like this ROM then do consider a donation to ZakooZ. THIS IS AN INITIAL BUILD WHICH MAY NOT BOOT AT ALL. HAVE A BACKUP BEFORE FLASHING THIS AND TRY AT YOUR OWN RISK. Installing a custom ROM on a Galaxy NOTE 10.1 WiFi (n1awifi) may require the bootloader to be unlocked, which may VOID your warranty and may delete all your data. Before proceeding further you may consider backup all data on the phone. You are the only person doing changes to your phone and I cannot be held responsible for the mistakes done by you. – Here is theTWRP update guide for the Galaxy NOTE 10.1 WiFi 2014 (n1awifi). Download and Copy the GApps and LineageOS 14.1 for Galaxy NOTE 10.1 WiFi ROM ZIP to your phone. First flash the Lineage OS 14.1 for Galaxy NOTE 10.1 WiFi ROM ZIP from device. Then flash the GApps zip from your device memory. Reboot and Enjoy the Nougat 7.1 LineageOS 14.1 ROM for Galaxy NOTE 10.1 WiFi (n1awifi). 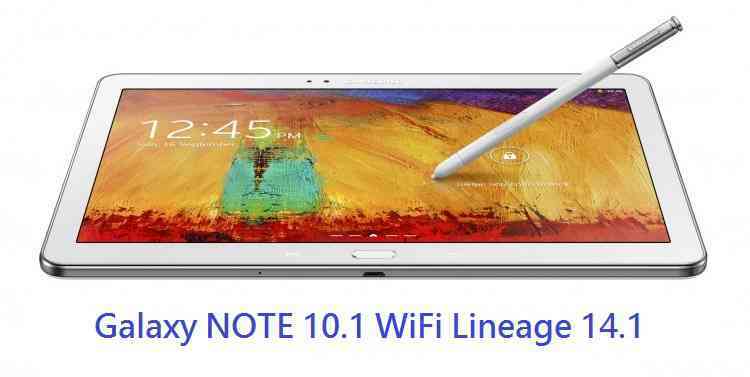 Copy the latest Lineage OS 14.1 for Galaxy NOTE 10.1 WiFi ROM ZIP file to your phone. Stay tuned or Subscribe to the Galaxy NOTE 10.1 WiFi 2014 (n1awifi) forum For other Android Nougat ROMs, Lineage OS 14.1 ROMs, other ROMs and all other device specific topics. Espero muito que seja possível ter a versão do Android O. Mas claro, ainda está em Beta pra ser dizer alguma coisa sobre compatibilidade. Muito obrigado pela ROM impecável! I hope it is possible to have the version of Android O. But of course, it is still in Beta to be saying something about compatibility. Many thanks for the flawless ROM!